The Hippopotamus or Hippo is the Greek name, which means the river horse. Hippo is one of the largest herbivorous mammals on earth. The hippopotamus has a big bold enormous trunk, very large mouth, huge teeth and short legs. The hippopotamus has three strong senses, sighting, smelling and hearing. 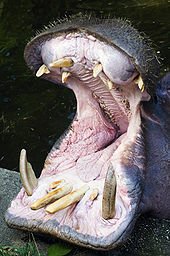 The hippo lives in the rivers and swamps in west and east Africa, most of the hippopotamus live in Zambia and Tanzania. Despite its short legs, it can run with a speed that can reach 30 Km per hour, it can also swim very fast. The hippopotamus spend the day in the water or the mud to keep its body cool. Although the hippopotamus is an herbivorous animal, but it is considered one of the most aggressive animals, it can run down a human easily. The hippopotamus live in groups that consists of a number of females young calves and few adult males, the group is lead by the strongest male. When fighting each other, the hippopotamus open his mouth widely in order to scare its rival. The lions, crocodiles and hyenas are the greatest enemies for the hippopotamus as they hunt the small hippopotamus. The hippopotamus is endangered because it is hunted for its meat and its teeth which is made from ivory. The hippopotamus kills people in Africa more than the insects and snakes. But actually they just attack humans when they feel they are threatened.